Musical Ecologies continues Thursday, December 19 with Brooklyn-based composer and bass clarinetist Michael Lowenstern. Widely regarded in the classical, jazz and contemporary music worlds as one of the premiere bass clarinetists, Lowenstern is increasingly known for his high-tech, genre-crossing solo performances of his original works. Combining formidable instrumental skills, computers, props and a range of electronic gizmos with his strong sense of humor and a deep appreciation for pop culture, Michael creates an infectious style that might loosely be called “ClassicoFunkTronica.” Following a conversation with series host Dan Joseph, Michael will perform a set drawing from his solo recordings Spin Cycle, Fade and Ten Children as well as new work from a forthcoming release in 2014. Musical Ecologies is a monthly symposium on music and sound held every 2nd Thursday (except where noted) at the Old Stone House in Park Slope, Brooklyn. Curated and hosted by composer Dan Joseph, each event typically focuses on a single artist who presents a work or project either in the form of a talk or lecture, a multimedia presentation, a performance, or combination thereof. Each presentation is preceded by a 30-minute conversation with the curator and audience and a reception follows. Michael Lowenstern, widely considered one of the finest bass clarinetists in the world, has performed, recorded and toured as a soloist and with ensembles of every variety. As a composer he has written music for concert, film, dance and various other new media over the span of his 23-year career. 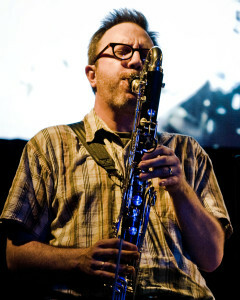 His collaborations have included remixes for the landmark recording “In C Remixed” (featured on NPR’s RadioLab), Michael Gordon’s video opera “Chaos” and various dance works with David Lang. To date he can be heard on over fifty CDs, including five solo recordings of his own. A graduate of the Interlochen Arts Academy, The Eastman School of Music, Stony Brook University and the Sweelinck Conservatorium Amsterdam, Michael serves on the faculty of the Manhattan School and the Juilliard School. By day he is the VP, Managing Director of Digital Advertising at R/GA New York. He lives with his wife and daughter in Bay Ridge, Brooklyn. Upcoming on Musical Ecologies: JD Parran (1/9); Stephanie Loveless (2/6); Eleonor Sandresky (3/13) and Mary Jane Leach (4/17). Comments closed — Trackbacks closed RSS 2.0 feed for these comments This entry (permalink) was posted on Thursday, November 14, 2013, at 9:02 am by Dan Joseph. Filed in press release.